Babe was one of the most famous and best-loved stars of the time. He was known for his greatness on the field and his popularity off the field. He was always willing to pose for the camera, sign autographs and joke around with reporters and fans. Beginning in the 1930’s, Babe began to appear in some radio productions and even in some short films and full movies! There was no TV yet, so kids listened to stories on the radio — just like people watch TV today. 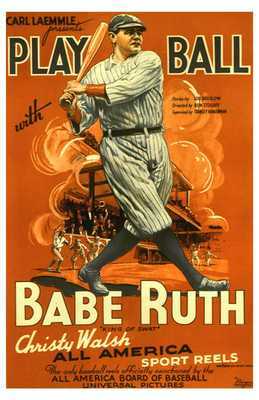 In 1934, there was a radio show called “The Adventures of Babe Ruth”. Brought to the airwaves by Quaker Oats, the shows were on the radio a few times a week, with a voice actor playing the role of Babe Ruth. 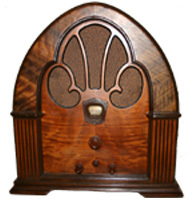 Later, Babe himself participated in some radio programs, including 1937’s “Sinclair Babe Ruth Program” as well as two in 1943 – “Here’s Babe Ruth” and “Baseball Quiz”. In addition, Babe was in several short films and feature-length movies. His pictures were very short and simple. Three of them, made in the 1920’s, were silent pictures: “How to Hit a Home Run”, “Headin’ Home” and “Play Ball with Babe Ruth”. A very nice man named Leon Fichman was in three of these short movies, including “Perfect Control”, when he was a kid. Mr. Fichman was 9-years-old at the time! We talked to him in the Summer of 2006 and you can hear his comments in our Audio Interviews section. Listen to Mr. Fichman talk about these films.